As you probably know already, Africom started an ad campagin for the launch of mobile telephony and some new data services last week. The full message of the availability of mobile telephony and the additional data services was made earlier this week. This morning, Africom sent us the tariffs for the new services. The voice tariffs are, well, let’s just say way cheaper than we expected! We generally expected that Africom would undercut the incumbent voice operators (Econet, NetOne, Telecel and TelOne) but we didn’t foresee it’d be by this much. On-net are calls within the network and Off-net is when a caller calls a number outside their network. All this is good news ofcourse, and we’re all excited. But there’s more to service than a tariff tag. Not to pour cold water on this great offering but there are the issues of network coverage and cost of setup that may see a lot of prospective subscribers discouraged from adopting the services at this stage. The limited network coverage means subscribers will need a backup mobile phone from the other mobile operators for those areas the Africom service hasn’t reached yet. Still, it’s not like Zimbabweans are not used to carrying multiple mobile phones at a time. There’s the issue of Africom using a different mobile voice technology as well (CDMA). This means subscribers will not be able to migrate to the Africom network without needing to buy a new mobile phone. You can click here to download the full tariff schedule (pdf document). We’re still working to get more details on the mobile phone devices needed for the Africom network and how much they’ll cost. This will have a lot of bearing on the uptake of the service. We have also requested the current coverage of the services. We would love to know your thoughts on this. Are you going to get yourself an Africom line? I`ll then use my Buddie to receive calls only and use the Africom line to make my cheap calls. Then I’d say you are a sucker for Afri-com..
Definitely going to take up this line, I like the data prices seem reasonable and more like NORMAL!!! Its much better than what the others were offering, but i thought telone was also offering the same CDMA facility with almost the very same specs as Africom, I wonder what happened to that? I suspect Telone`s CDMA network offer a fixed/nomadic service. Yu dont expect to mantain a connection when yu move from one basestation to onother. and oh by the way, is the comparison really legitimate, coz from your explanation it sounds like Africom is offering CDMA kindo phones though they will be mobile and the rest are GSM kindo lines, where you dont need a GSM capable phone, MAybe just to find out more wht exactly wil the package be like? not really smart i thnk,y wd i want to invest that i can only use in sme part of harare.ima w8 on this one, my econet n telecel lines will suffice for nw. By all means, their tarrifs are way too too cheap, the ROI for buying the africom handset is offset by the low cost of minutes, which means in the long run it makes perfect business sense to buy the phone and recoup on your minutes savings. The price of the phone would help in making this perspective make sense. Do you mean cheap as in a Smadl phone:-) granted in the long run you will incessantly incur “network busy” messages and suffer network interruptions then your implied ROI formula wont apply. It would be shortsighted for us to assume you won’t have to pay for “registration”.They could even sell you the SIM card for whatever price, since they will have a monopoly on you. What you will get is a basic phone(no Apples and Berries) + (assumed)pricey SIM+some connection fee. Some advice would be for you to stick with your current provider and adopt a wait-and-see stance. Not all mobile phone users are telecom geeks. Who would really care what CDMA/GSM/WCDMA they are using. What matters is that I get to make a call, anytime of the day, no excuses. By the way the $0.06 is for internetwork calls and you would have to convince your friends, family and workmates to buy the phone for the whole deal to make sense. @SONET Telone has CDMA voice in Harare going at $0.05/min, give me one good reason why you are not using it? I have got that 2kg CDMA phone at my home. Okay now yu want me to carry that big thing around. I thot telone uses CDMA for its Wireless Local Loop not high mobility cellular comms. lol, I like the 2KG part of it! Fine print?? Are those free minutes /sms’s usable with other providers? @Tindo whats the price of the cheapest phone that they have in their shop? This is very good news. Zimbos tinonetsa ku hater too much I can see some of the comments. Lets be happy becoz this will cause other players to review their tariffs which will at the end benefit everyone. We forget one thing that the day Econet started in the 90s they were only available in Harare and grew to other parts of the country over about 14 years now. Lets give Africom time at least this is a good start. Africom has presence in major cities from their ISP business and they can as well piggy back on some of that infrastructure. They will get there if they are dedicated and offer good service to the people. Airtel did the same in Kenya and Safaricom is seeing flames and is reducing their tariffs now. Their business model will work if they can look at VAS in order to increase their value chain. Let the market decide! Power to the mobile user! excellent news indeed, let the competition for customers begin. i am rather amazed that Africom has a website(inert it may be) but cant even bother to announce/publish such important information there. its for free and can be accessed every corner of the globe (maybe even as far as Mars).They should shove a lot of useful information there including fine print detail, why arent they using it, we r in 2011? their marketing & website techguys guys need a gud telling off! 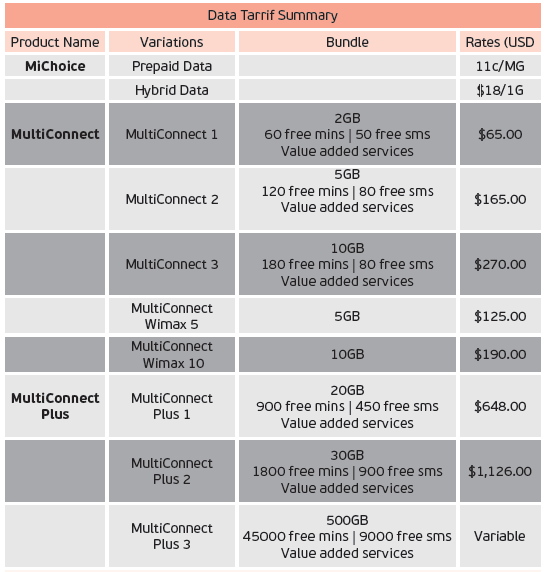 is it jus me or are the tariffs for the michoice hybrid data a little misleading. is it $18 per gig and for every gig thereafter or is it $18 jus for the first gig ? first Gig. thereafter it’s 11 cents per MB. I heard their coverage is good for a start, They said Harare is covered, Norton is covered, Chitungwiza is covered, Marondera, Rusape, Mutare, Bulawayo, Gweru, Kwekwe. That’s a big deal for starters in this business. Afri-com now we are talking mobile broadband. Thanks James,noted…we’ll look into it. im curious,wat sort of deals are they offering on the phones.someone commented earlier on being able to afford an htc? why is this stuff not on their website?doesnt make sense? I agree ,it doesnt make sense. these guys they dont update their site and site is 98% unavailable. To all Afri-com fanboys, please help yourselves with answers to the issues I highlighted before;Coverage, SIM card price, CDMA phone price, and calling other networks (which I doubt is available)…. By the way I’m not hating on them as insinuated in an earlier post, I’m just shedding light on the grey errors..it’s a promise they made at ICT Africa (Oct)2010 only to deliver now anywhere. Coverage———– do yu expect 100% coverage on the 1st day of launch? lets be realistic, major cities enough for a start. “Afri-com”That strange domain name messes up their identity doesn’t it. And I wonder how many prospective customers they lose to the africom.com domain. This is very good progress that should be welcome with both hands, the more players in the market, the better & cheaper the service cos we’v got choice, now waiting to see what Valley Technologies has in store for us. As far as i’m concerned Africom still has a long long way to go, their customer service is poor when it comes to their mobile broadband, what more when they start offering telephone service. Lets be realistic, if a company that offers internet service cant even update their website or put any helpful info, that says a lot for the service that they’ll be offering. I’m not a hater but a very ticked off Africom customer. Thats interesting considering that their coverage dosent even reach Mt Pleasant! All has been said but,, the truth still stands Africom is getting there,, Rome was not built in one day. It was a bold decision to introduce such technology, moreover reasonable tarrifs considering other existing players. Only time will tell.